Getting braces is a pretty significant event, no matter how old you are. Your whole mouth will feel different, and some of your habits will need to change. If you choose traditional braces with metal or plastic brackets, one of the biggest changes you’ll face is the foods you can eat. Many of our patients dread learning about all the foods they can’t eat. Generally, they already know what they should avoid foods that are super-sticky or very hard to chew, but what does that really mean? If you’re worried about the impact of braces on your menu, you don’t need to be. A braces-friendly diet doesn’t have to be boring. 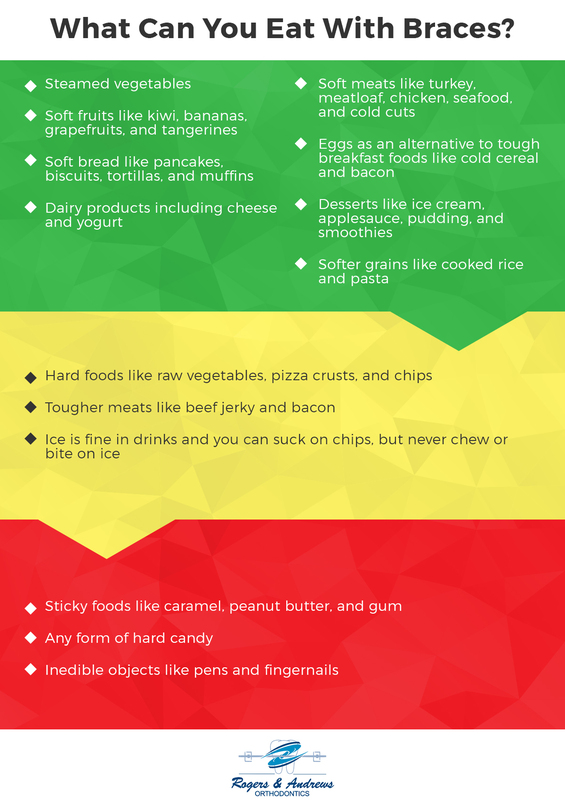 There are actually many foods you can enjoy during your time with braces. At Rogers & Andrews Orthodontics, we work hard to ensure our patients feel confident and fully informed about how to care for their teeth and braces during treatment. 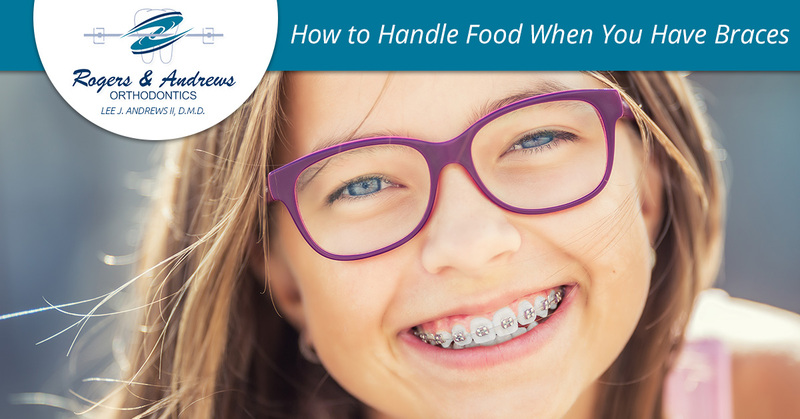 In today’s blog, we’re going to dive into what your food choices should (and shouldn’t) look like while you have braces. Keep in mind that these are general guidelines and don’t include any special diet guidelines you may have. Some foods are fine to consume if you do so with care. The following list should help you understand what we mean. These are foods that will damage your braces pretty much every time. It’s a good idea to simply steer clear of them until your braces come off. If you’re thinking, “I can’t have my favorite treat for how long?” you aren’t alone! Avoiding enjoyable foods to protect your braces can be a struggle, especially if you know you’re going to have braces for a long time. However, it’s important to keep your eye on the prize: getting those braces eventually removed. Loosened wires and broken brackets slow your treatment down, and we’re pretty confident that is the last thing you want. Instead of extending your treatment time, make smart choices and turn to us with any questions you may have. Contact us in Thompson to learn more today!